#How to Apply Online on telanganams.cgg.gov.in for TSMS CET 2019: Online Applying procedure for Telangana Model Schools 6th Class Entrance Test 2019 Notification/TS Model Schools VI Class Admission Test 2019: As per APMS CET 2019, same methodology will be followed to the TSMS CET 2019. The Commissioner and School Education Department officials and Rashtriya Madyamika Siksha Abhiyan will issue the TS Model School 6th Class Entrance Test 2019 Notification and application will be invited through online mode at TSMS Web portal from the eligible students for appearing the VI Class Admission Test 2019 for admission into 6th class in TS Model Schools for the academic year 2019-2020. Here we are provided for information purpose only. Official Notification is not released. Students after satisfying above conditions, have to pay fees through mee-seva, online centers with particulars and obtain General number. Mere obtaining general number will not be considered unless he/she submits the online application. The general number is only in evidence of payment of examination fee. After obtaining general number they have to submit online application to http://telanganams.cgg.gov.in/ (online). The list of Model Schools and application formats are kept in website http://telanganams.cgg.gov.in/ and download the same. Center for conducting examinations will be at District Head Quarters (Name of the Center will be printed in the Hall Ticket). Hall Tickets can be downloaded online as per reference number allotted to the candidates (as per schedule indicated supra). Note: Hall Tickets will not be dispatched by post and shall be downloaded from website. 1. Before submitting online application a sample application format may be filled and furnish correct information. 2. Keep pass port size photo readily with them. 3. Utmost care should be taken while filling the online application. 4. The candidate is responsible for any mistakes committed by him in online application and no further corrections shall be entertained. 5. Mere appearing for admission test will not confer any right on the student for admission into Model School. * Below details to be ready with them for online applying at http: // telanganams. cgg. gov. in for TS Model School Entrance test for Admissions for 6th class and remaining vacant seats. Step 1. First go the official website by entering the url address telangnams.cgg.gov.in in your browser. Then Telangana Model School Official website portal will be appeared. Step 1. Now Search for Telangana Model Schools 6th class Admissions 2019-18 and click on "Click Here" button. Step 1. Then Registration Form for TS Model Schools(6th Class Entrance Test.) page will be opened in the new browser with full window and full screen. Step 1. 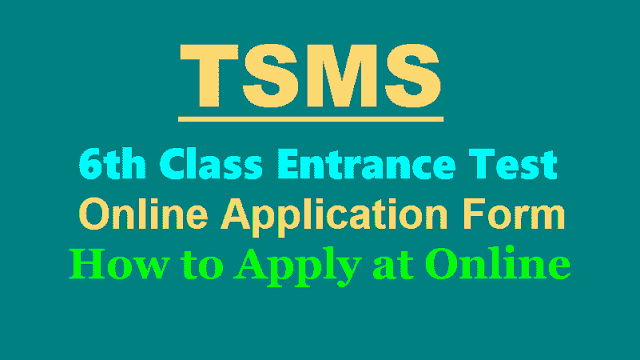 The eligible student shall first go through the information bulletin( information bulletin will be issued) carefully and read the notification and satisfy their eligibility for appearing for TSMS CET 2019. Step 1. The candidate after satisfying himself/herself about the eligibility criteria for the submission of application through online shall pay a fee of Rs.50.00 for BC/ SCs/STs and Rs.100/- for OC students through TSONLINE for submission of application through Online. Step 1. At the TS ONLINE CENTER the candidate has to give the required preliminary data (i.e. Name of the candidate, Date of birth and mobile phone number). Step 1. On receipt of fee at TS ON LINE, the candidate shall be issued with a Journal Number’ with which she/he can proceed with submission of application through online through the website telanganams.cgg.gov.in. Issue of Journal Number does not mean that the candidate has completed submission of application online. It is only a confirmation of the fee received. Step 1. The candidates shall follow the procedure for submission of online application. The Candidate should be ready with the model application form, candidates should be ready with a photograph of size 3.5 X 4.5 cms. The Photo should be scanned and uploaded along with the application form for such candidates. Step 2. While filling the on line application, the candidate has to opt the model school. Step 3. The candidate need not posses any certificate at the time of apply, but the candidates must obtain original certificates (Caste, Income, Study, Special category) by the time of counselling. Step 4. On submission of Application ONLINE, the candidate has to take a copy(print) of application form in which a reference number also be given. This Reference number is required to download the Hall Ticket. The copy of online application is to be preserved for further reference. Step 5. For any mistakes/incorrect information, the candidate is solely held responsible. Hence, they must take utmost care while filling the online application. Step 6. The Applications of the ineligible candidates will be rejected Summarily. Step 7. The selected Candidate should be able to produce the original certificates at the time of admission as a proof to the information furnished in the application. Step 8. The selection of the candidate will be summarily rejected if they fail to submit the necessary documents at the time of admission. After Submission of 6th class entrance online application the same print copy for admission must be submitted to the concerned Telangana Model School Principal in which the candidate is seeking admission. Note: In case after completion of payment if screen hangs or no response wait for minimum 15 mins before attempting fresh transaction. 12. Name of The School And Mandal Seeking Admission. 13. Details of Examination Fee Paid / Reference Id No. The information furnished above is true and to the best of my knowledge. I will produce the original as and when asked by the Department at the time of Admission. I am aware that any wrong information furnished by me disqualifies my selection automatically. Signature of the Parent Signature of the candidate. Enter the Verification Code as displayed in the image in required field and read the declaration click on the radio button of Mere registration does not confer any right for Admission. Admissions will be made as per rules/regulations in vogue. Now click on the preview button and once check form and take the print out and submit to the concerned your mandal model school principal.